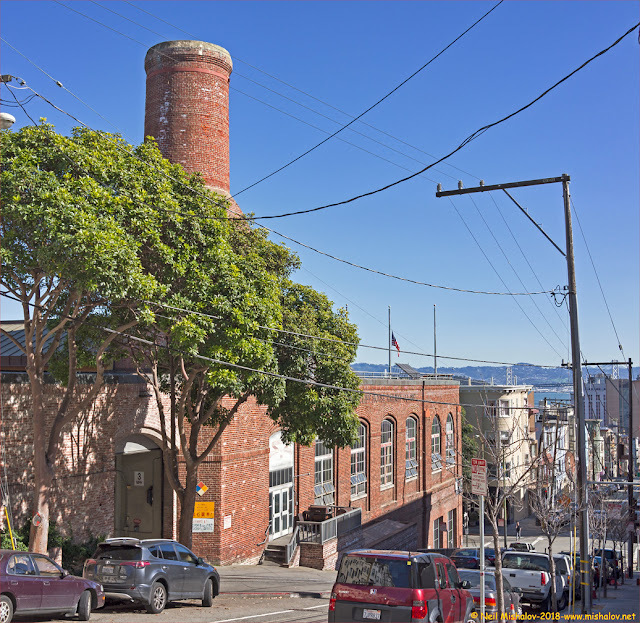 Views of San Francisco, including the Mason Street cable car barn & powerhouse. Click on an image to view the full-size photograph. 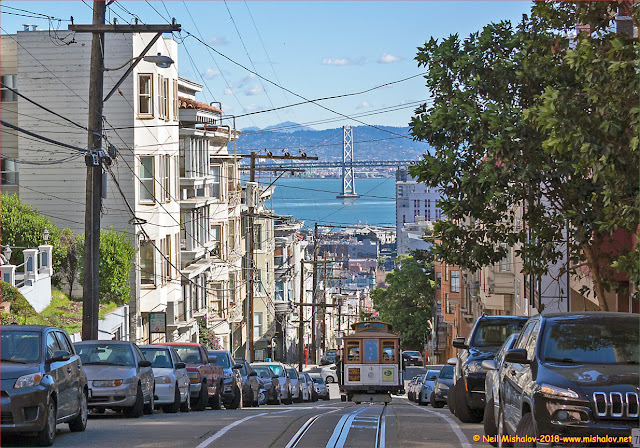 The San Francisco cable car system was established in 1875. 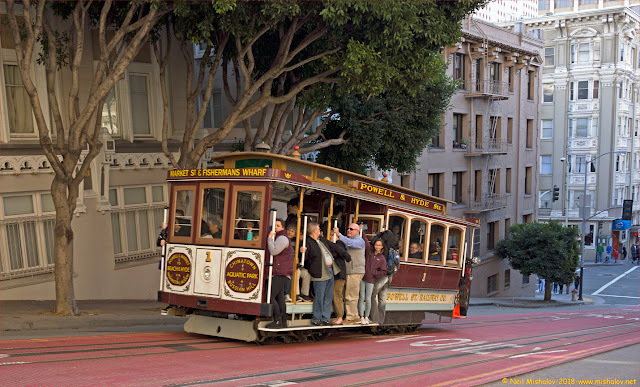 Between 1875 and 1890 there were twenty-three different cable car lines in San Francisco. 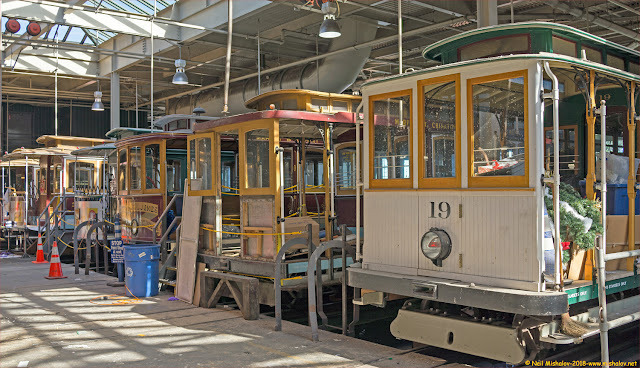 There were also fourteen cable car barns and powerhouses that powered and housed the cable cars. 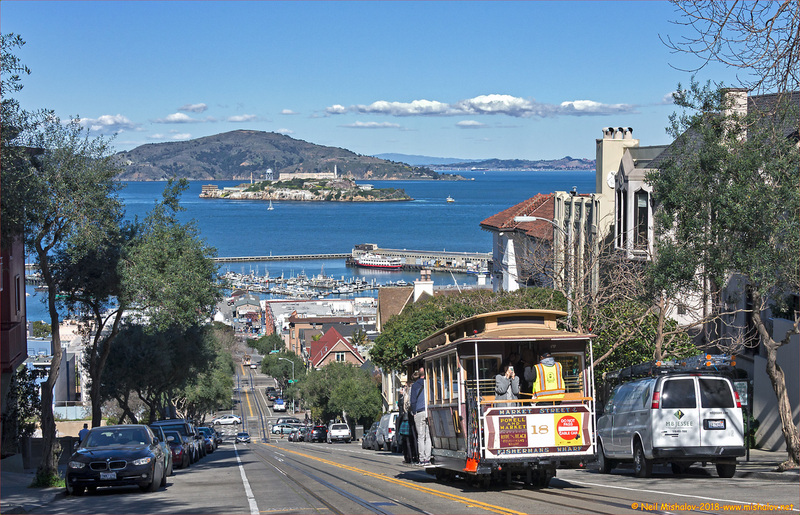 Today three cable car lines remain in operation. 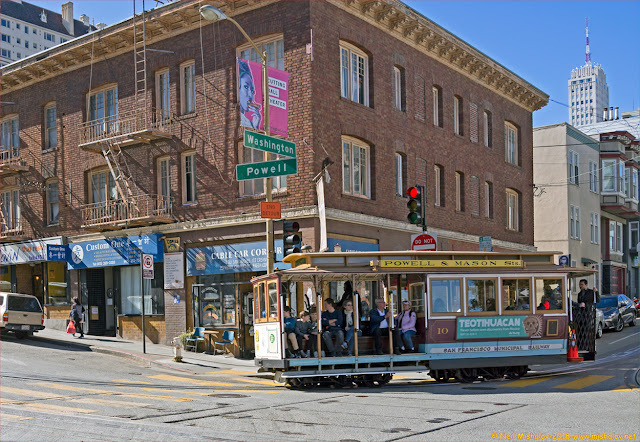 The three operational lines are powered by the one remaining cable car powerhouse, which is located on Mason Street between Jackson Street and Washington Street. 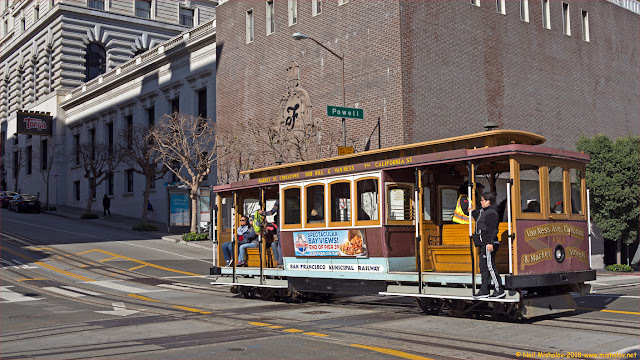 The cable car lines currently operational are the Powell/Hyde Street route, the California Street route, and the Powell/Mason Street route. This picture shows cable car #18 traveling north on the Powell/Hyde Street route; it is heading down Hyde Street to the turnaround at Fisherman's Wharf. Alcatraz Island and Angel Island are visible in the background. Andrew Smith Hallidie was the inventor of the San Francisco cable car system. He was born in London, England on 16 March 1836 and he died in San Francisco on 24 April 1900. Cable car #4 is cranking up Jackson Street on the Powell/Hyde Street route. Mount Diablo is visible in the distance. This view from Washington Street shows the south side of the Mason Street Cable Car Barn and Powerhouse. The open entryway just below and to the left of the chimney is where the operational cable cars leave the barn in the morning. The cable cars reenter the barn in the evening on Jackson Street which is on the opposite side of the building. This view is looking east. 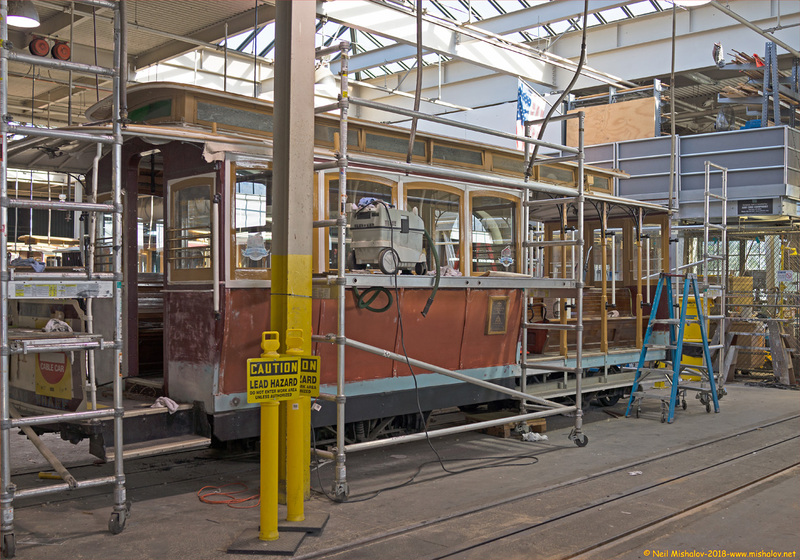 A view of the area of the cable car barn where cable cars are refurbished and repaired. This is cable car #50. A cable car being repaired and refurbished. Cable cars in differing states of repair. 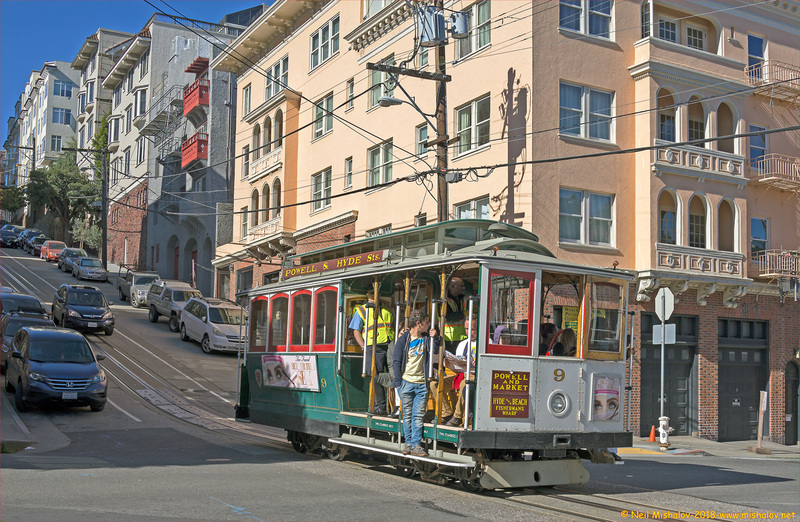 Cable car #19 is identifiable. Cable car #13 is in the shop. Cable car #28 is rolling up Jackson Street on its way to the Hyde Street turnaround at Fisherman's Wharf. Cable car #9 is heading down Washington Street on its way to the Powell Street turnaround. Cable car #10 is turning on to Powell Street on the Powell/Mason Street route. Its destination is the Powell Street turnaround. 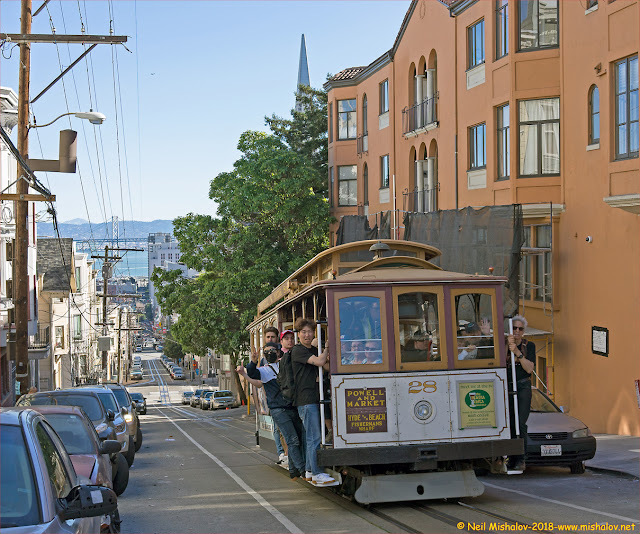 Cable car #25 is turning on to Mason Street and heading to the Mason Street turnaround. 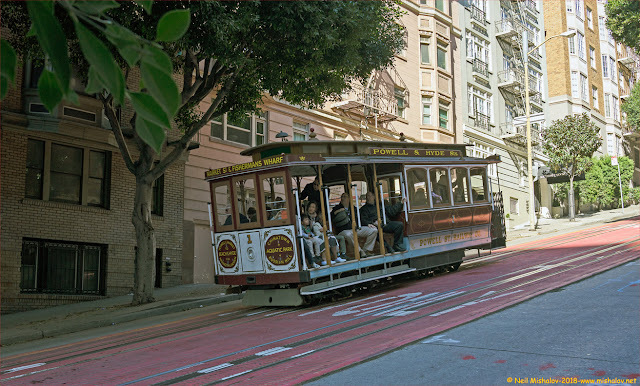 Here is cable car #1 traveling south down Powell Street. 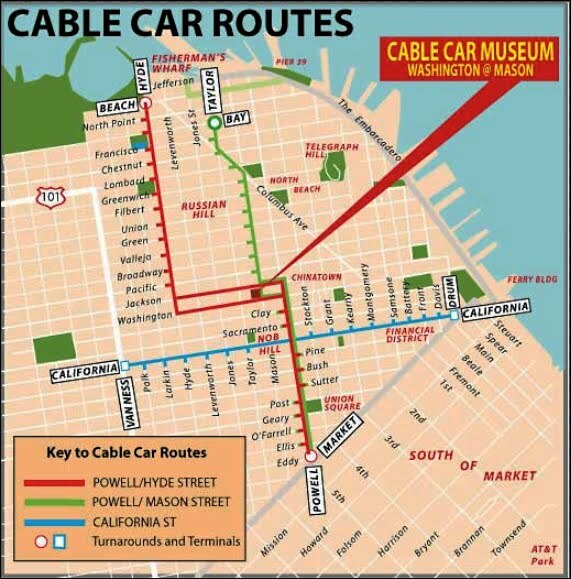 The cable car is within a few blocks of the Powell Street turnaround. Cable car #60 is traveling on the California Street route. 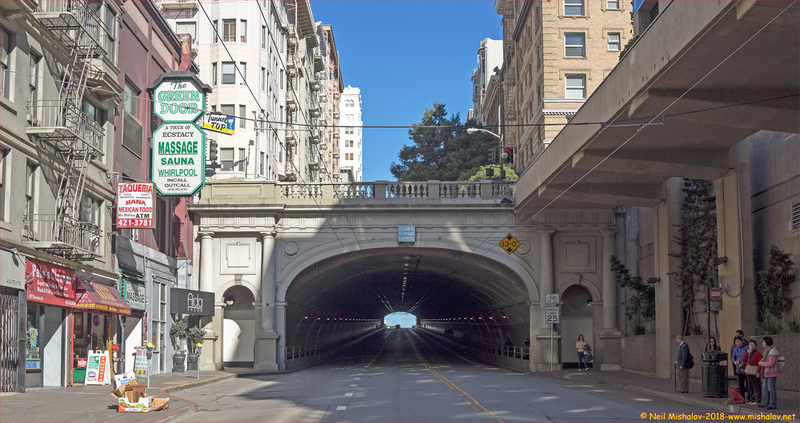 It is crossing Powell Street and is heading west on California Street to the terminal on California Street at Van Ness Avenue. 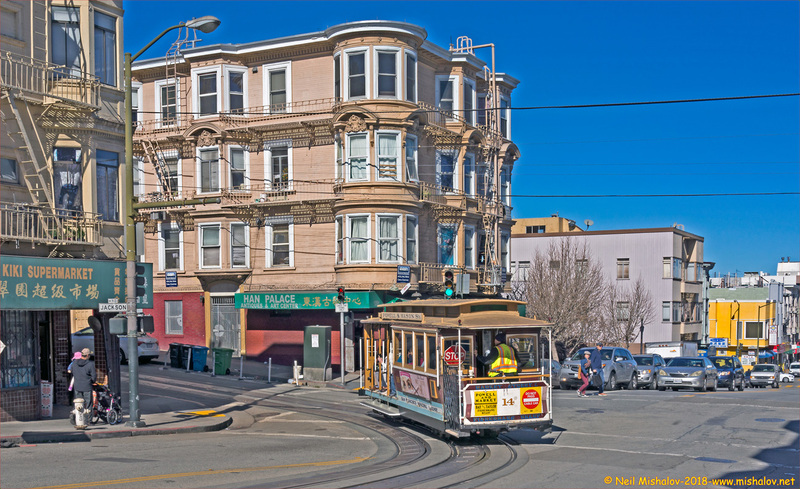 Cable car #14 is turning on to Jackson Street. It will travel one block on Jackson Street then turn north on Mason Street on its way to the Taylor Street turnaround. Here is another view of cable car #1. It is now traveling north up Powell Street. This is Rick Laubscher, the president and founder of San Francisco's Market Street Railway. 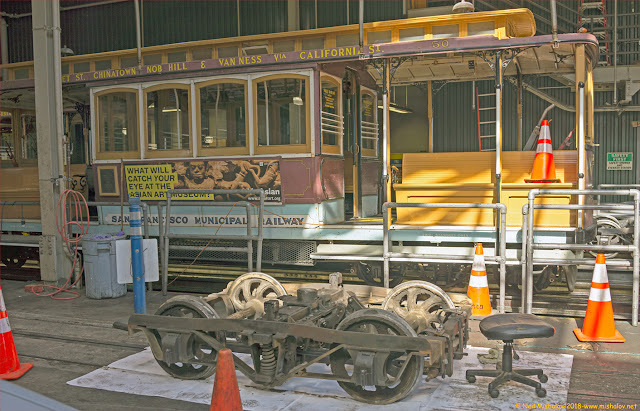 Amongst the endeavors of Market Street Railway is the preservation of San Francisco's historic streetcars and cable cars. 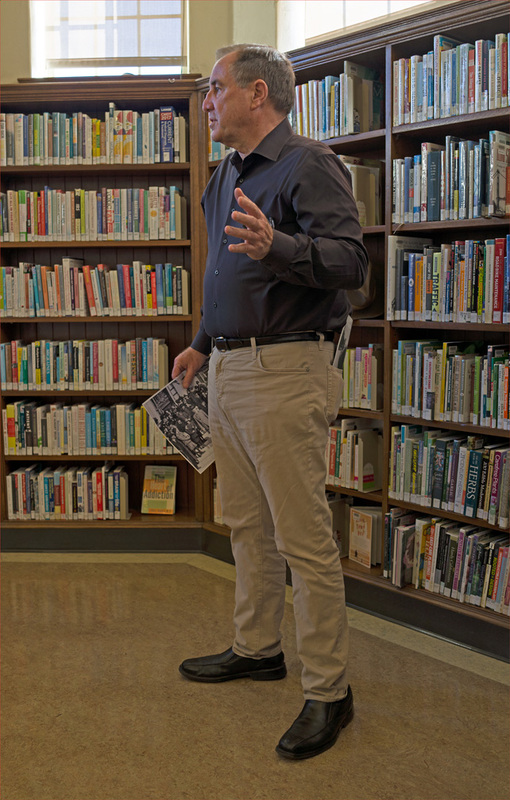 This photo was taken on 3 February 2018, and Mr. Laubscher is at San Francisco's West Portal Branch Library, where he is talking about the history of Twin Peaks Tunnel. The streetcar tunnel commenced operation precisely one hundred years ago on 3 February 1918. 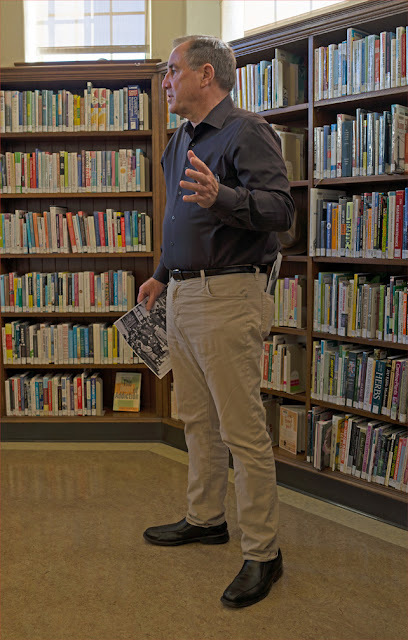 The West Portal Branch Library is across the street from the west portal of Twin Peaks Tunnel. In celebration of the one-hundredth anniversary of Twin Peaks Tunnel, Mr. Laubscher wrote "Tunnel Vision," a splendid article about the significant benefits the tunnel has bestowed on the people of San Francisco. 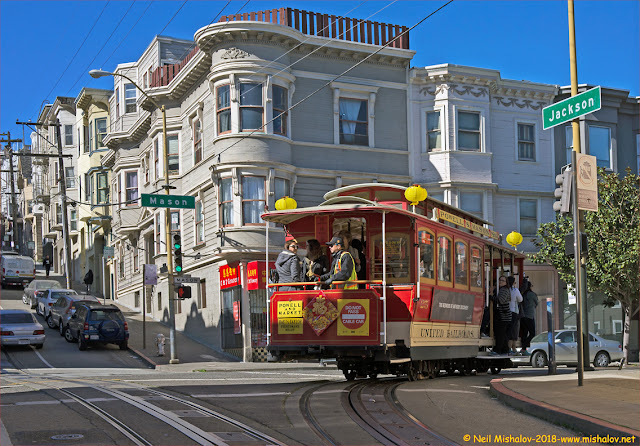 Mr. Laubscher has also authored "On Track: A Field Guide to San Francisco's Streetcars and Cable Cars." 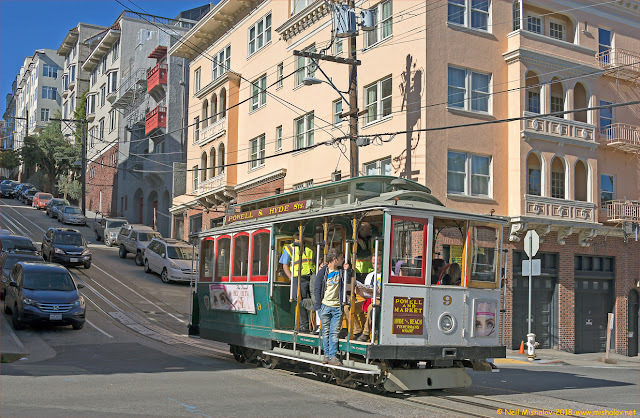 It is an impressive book about the many cable cars and streetcars that roll up, down, and around the streets of San Francisco. 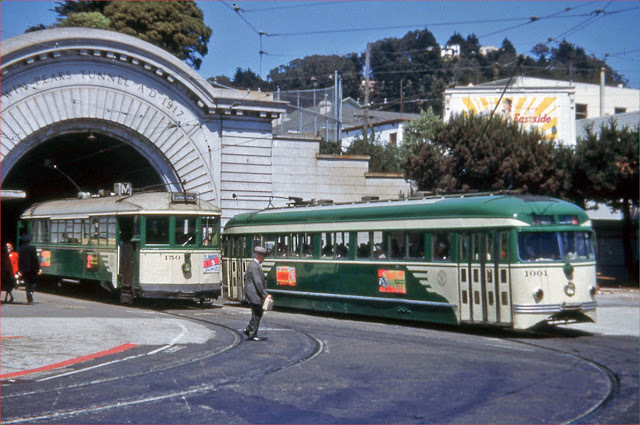 THEN A photo taken on 1 June 1951 at the west portal of Twin Peaks Tunnel. Car #150 was constructed in 1914, and Car #1001 was built in 1951. 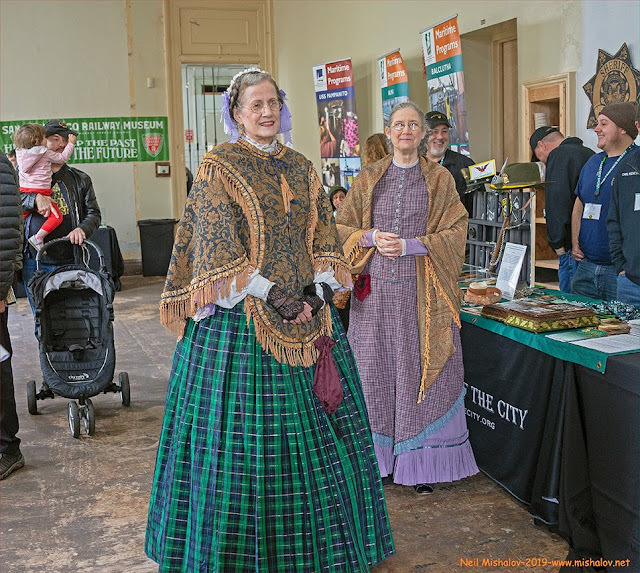 This photo is courtesy of Market Street Railway. A view of the World War II Liberty Ship SS Jeremiah O'Brien. Her keel was laid in Portland, Maine on 6 May 1943, and she was launched on 19 June 1943. In 1994 she steamed from San Francisco to Omaha Beach in Normandy, France, to celebrate the 50th anniversary of the invasion of Nazi-held Europe. She is docked at Fisherman's Wharf and is open for public viewing. 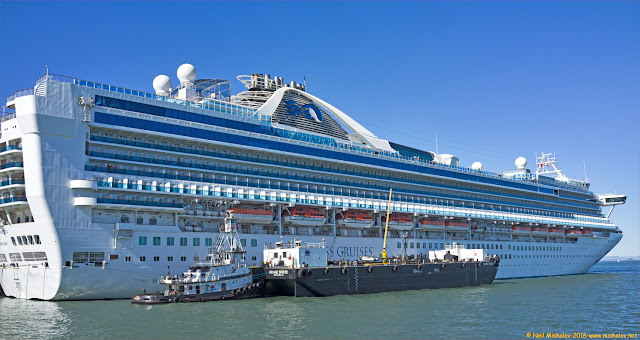 This is the MS Costa Luminosa cruise ship. 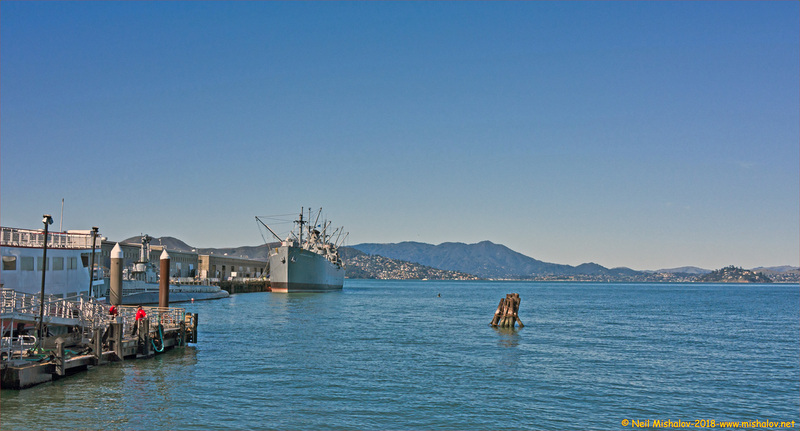 She entered service on 5 May 2009 and is now making a port call in San Francisco while on a world cruise. Her port of registry is Genoa, Italy. 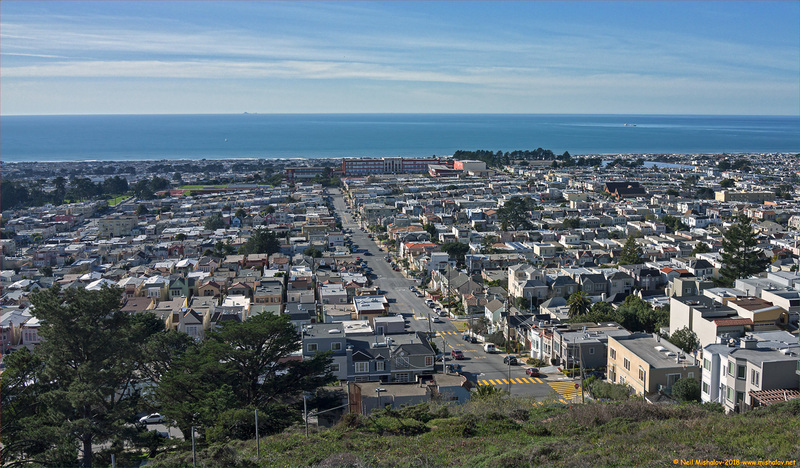 A view of the north side of Telegraph Hill. 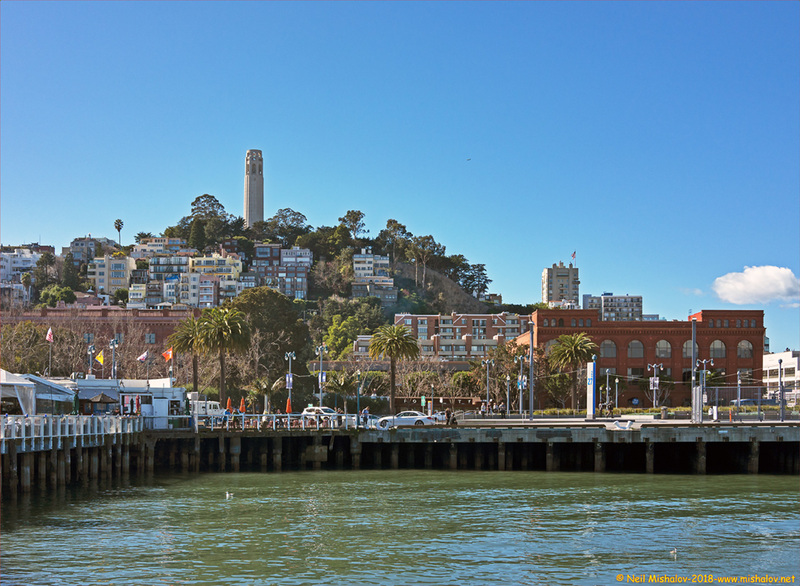 Coit Tower is sited on the summit. The Grand Princess cruise ship was built in Italy in 1998, and San Francisco is her home port. This picture was taken from Hawk Hill Park; the view is looking east. Mount Davidson plus the St Francis Wood neighborhood, the Forest Hill neighborhood, and the West Portal neighborhood are all visible. On the right in the distance is San Bruno Mountain. 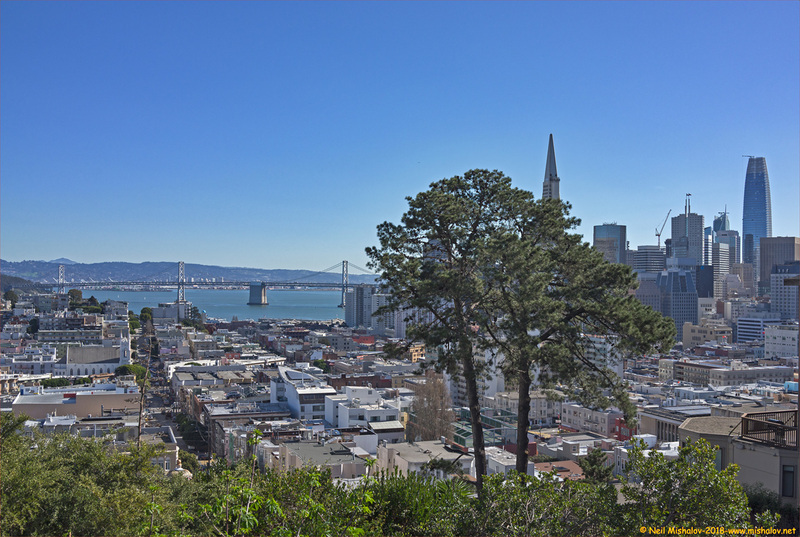 A view from Ina Coolbrith Park, the high point of Nob Hill. On the far right is the Transbay Tower, the tallest building in San Francisco. 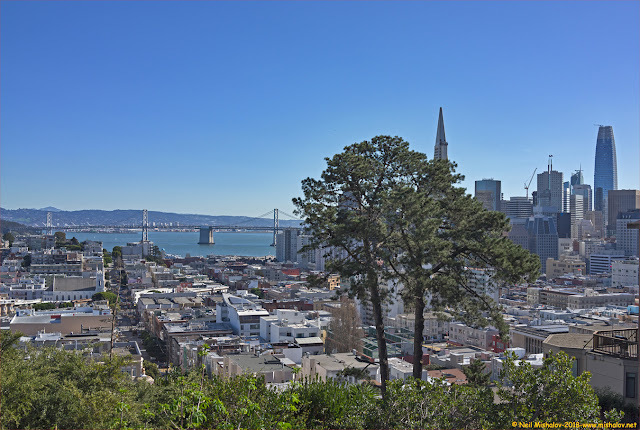 The Transamerica Pyramid, partially hidden by the trees, recently had the distinction of being the tallest building in San Francisco. 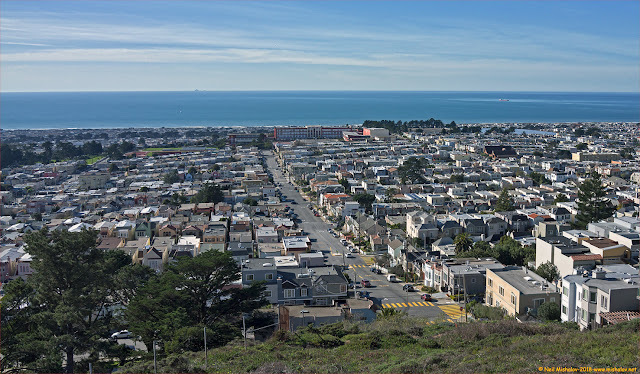 This photo was taken from Hawk Hill Park, the view is of the Pacific Ocean and the Sunset District of San Francisco. If you look closely at the horizon, you can see the Farallon Islands which are sited 30 miles from the coast. 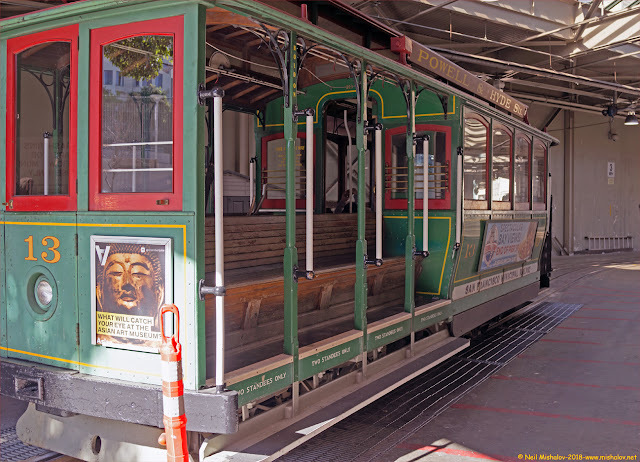 I have subsequently posted on this blog "Market Street Railway-Holiday decorations for a streetcar built in 1928 and a cable car built in 1887."